They eat, they get full, they move on and flock. Come handle the geese and feed the blimps. Below are links and abstracts for the two projects. We designed a working metaphor of a new ecology of things by using networked objects. This was possible through the sponsorship of Sun Microsystems who donated instrumental technology: The ALAVs are autonomous objects that are in a continual search for activities represented by flocking and feeding. These parameters arose as a result of the possibilities of the provided technology. The technical constraints were translated into novel reinterpretations of a concept. This project is in collaboration with Nikhil Mitter. 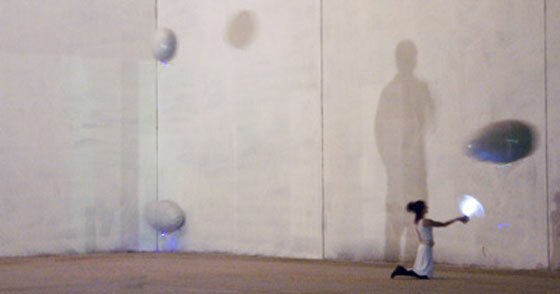 GeeseNecks represent a living language using gesture from the body in a physical space. The visualization takes the form of luminosity. 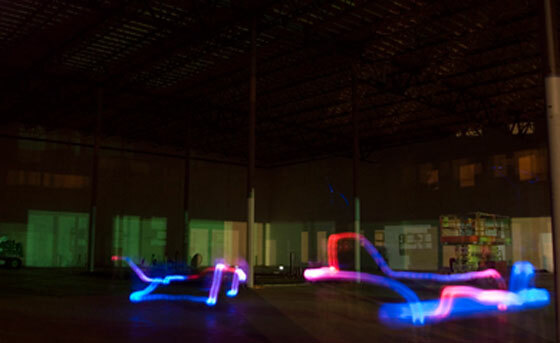 A group of self-aware objects communicate a physical presence between each other, referencing a visual understanding of the boundaries of proximity inherent in wireless communication. In our quest for an informed audience, Jed will speak about these projects and more at Machine Project in Echo Park on Saturday the 12th at 8pm for Make Magazine’s Issue #7 (Backyard Biology) Launch Party. Machine Project is located 1200 D N. Alvarado St.